The botanical trend has been everywhere lately…..with the palm leaves, tropical vibes and the island feel whats not to love! I love anything green and leafy, but how do you get the vibe of this trend in an already designed or existing space? Here are my tips – pillows/cushions are an instant way to bring home a new/trendy look, so are smaller pieces like dinnerware, vases and wall art. A great tip here is to break the pattern by adding a calmer pattern or color like the white floral cushion which still has the island vibe but is calmer because of the white! 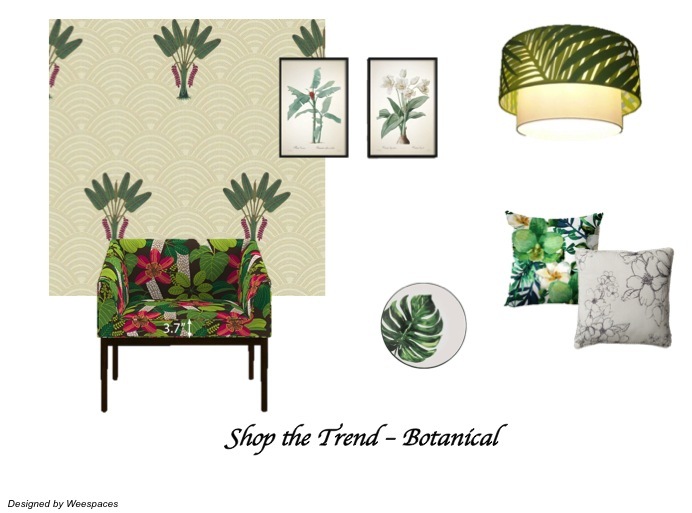 And if you’re feeling this a bit more and want to plunge right into some tropical leafy goodness…I love the idea of wallpaper, an accent chair, a pendant light or even curtains! 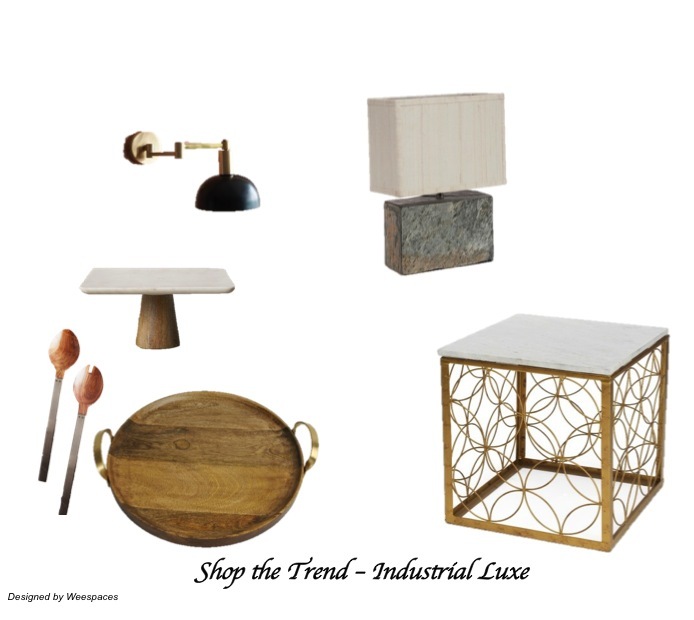 One of my favorite trends of the season – Industrial Luxe! Edgy, glam and chic! Here’s how to nail the look if you don’t want to change up the look of your whole house but still want to embrace the trend in small but sure ways! Jewel tones are a big trend this season…..deep rich hues like royal blue, amethyst, emerald and ruby are taking over pastels and muted tones! 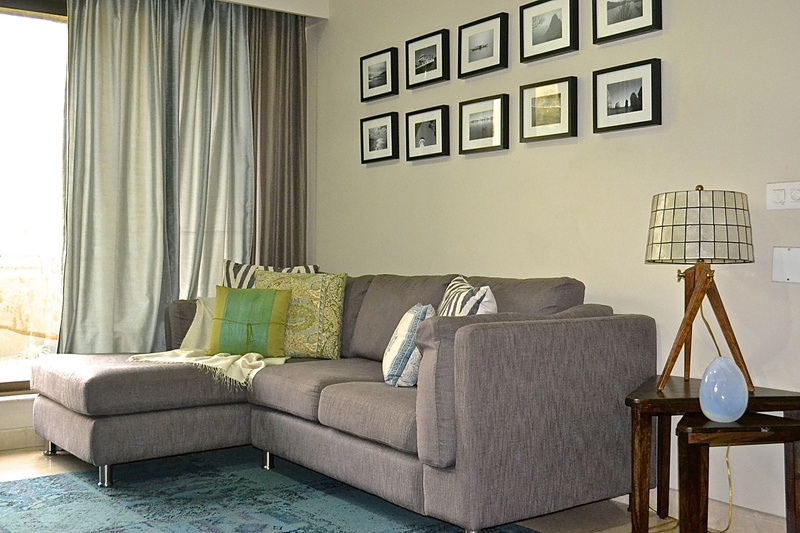 Here’s how you can bring the look home without making it look overdone! Sheer fabrics, glass, natural texture and fabrics help tone things down while still keeping with the rich colors. 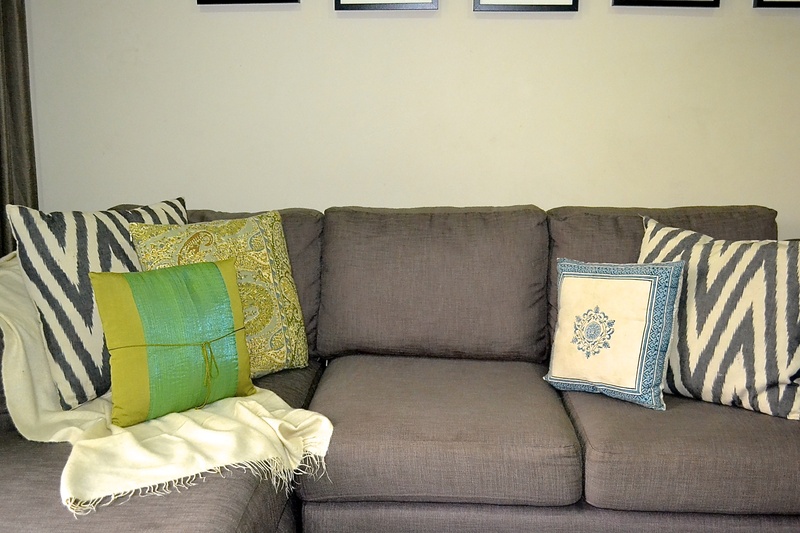 Weestyled – How to style your sofa? 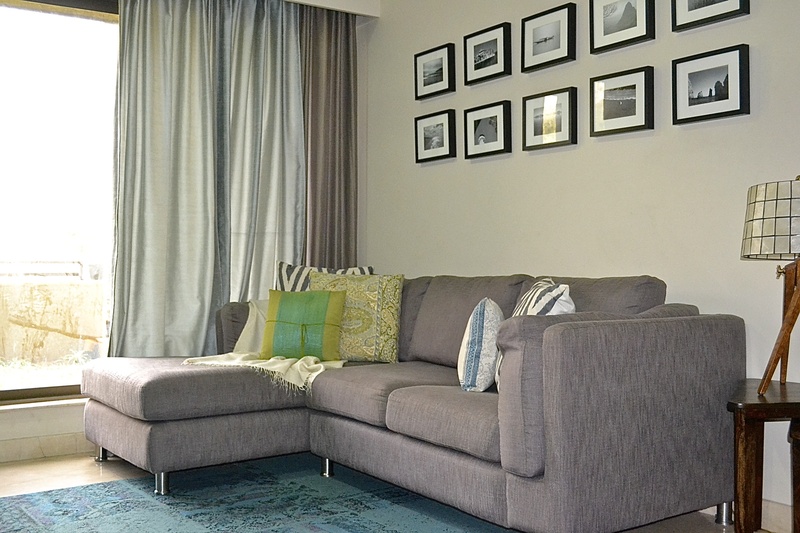 Next up on our Weestyled series of styling tips for your home our simple 5 steps to style your sofa. 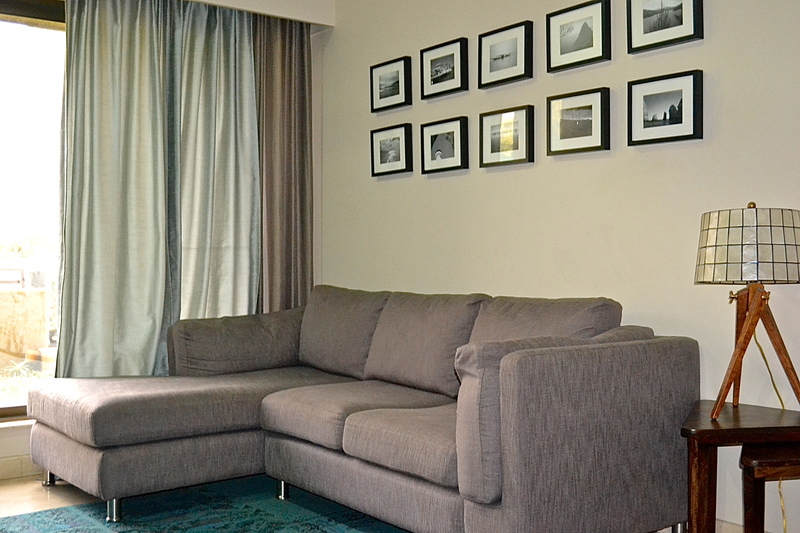 A well styled sofa is not just stylish to look at but should also be comfortable to sit on. Large pillows to lean against and a few smaller pillows for support as well as looks, a soft throw to wrap around while you watch your favorite show, a lamp for some warm light and wall art framing the wall behind your sofa. 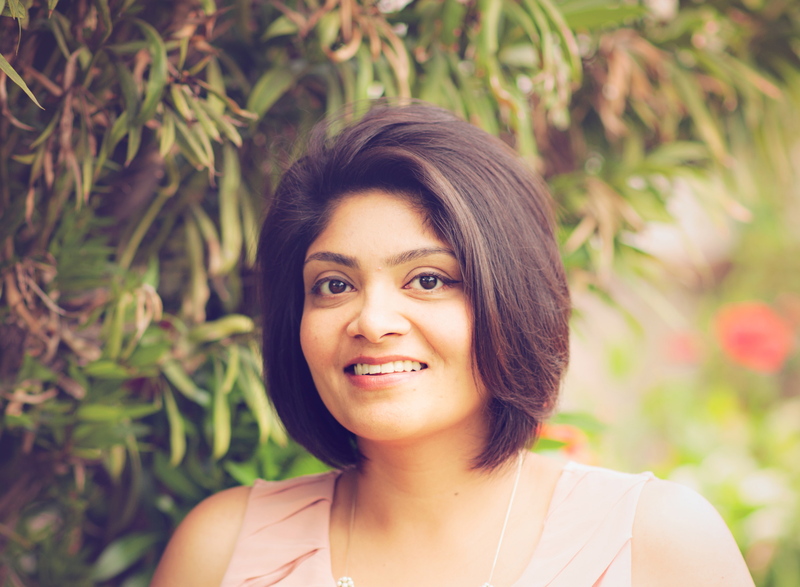 Here are 5 simple steps to get the look! Your sofa needs a backdrop. 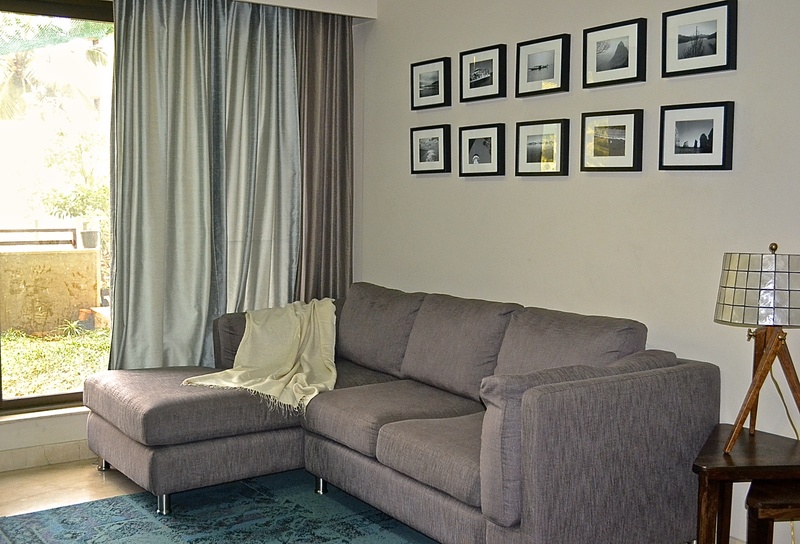 Something that frames the blank wall behind and brings in visual interest! Art can be large prints, a canvas, gallery wall of pictures, a vintage textile, bohemian wall hangings, eclectic baskets or plates…really, the options are endless! 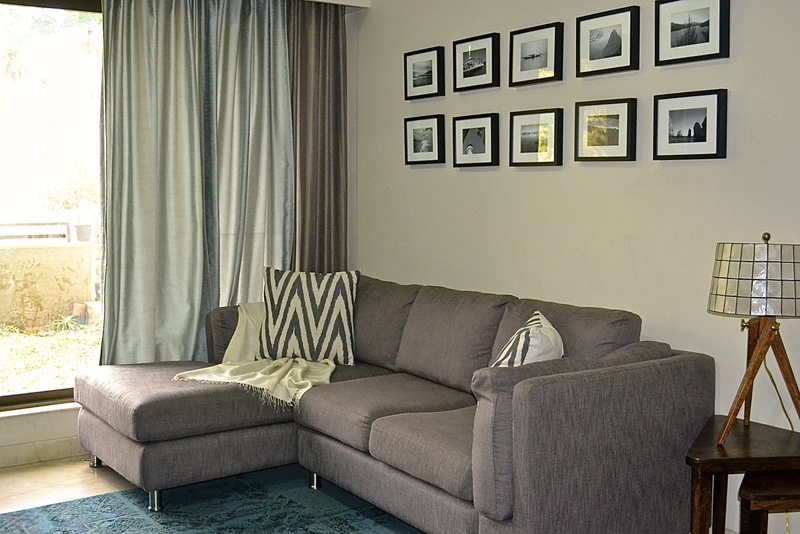 In this case we started with a gallery wall of black and white pictures from our various travels, that acts as a simple yet graphic backdrop for our gray sofa. A small side table with a lamp adds lighting as well as a spot to park your glass or book. Here we have nested tables and a wooden tripod lamp with a plaid black and white shade that plays off the black and white gallery wall beautifully! Dress up your sofa and start by adding a soft throw. 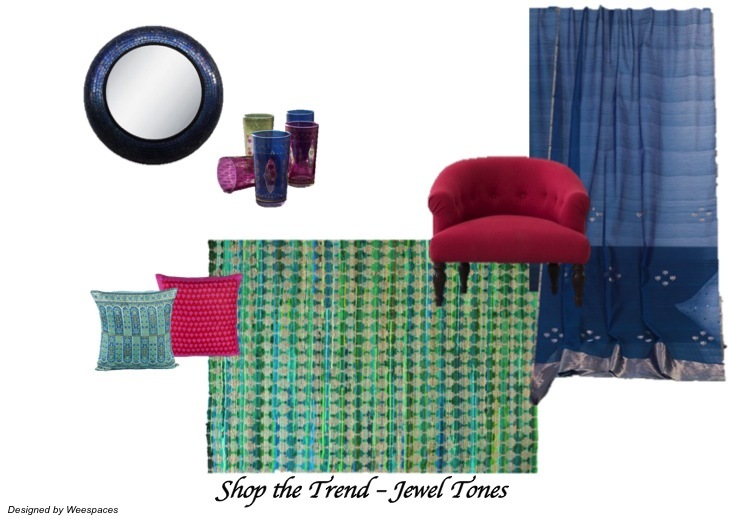 Throws can be in vibrant solid colors, geometric patterns or even eclectic prints like an ikat! We have a soft white throw here keeping the palette neutral and clean. Start with at least two large pillows on both sides. I recommend keeping them similar to bring in some symmetry or at least within the same color family with same scaled patterns. Next throw in smaller pillows in a different color to bring in a pop of color as in this case or to create some variety and interest. Add an object like the pearl white vase in our picture, a small plant, a photo frame or anything that speaks your style and brings in some visual appeal to complete the space. Shop the Trend – Maximalism! 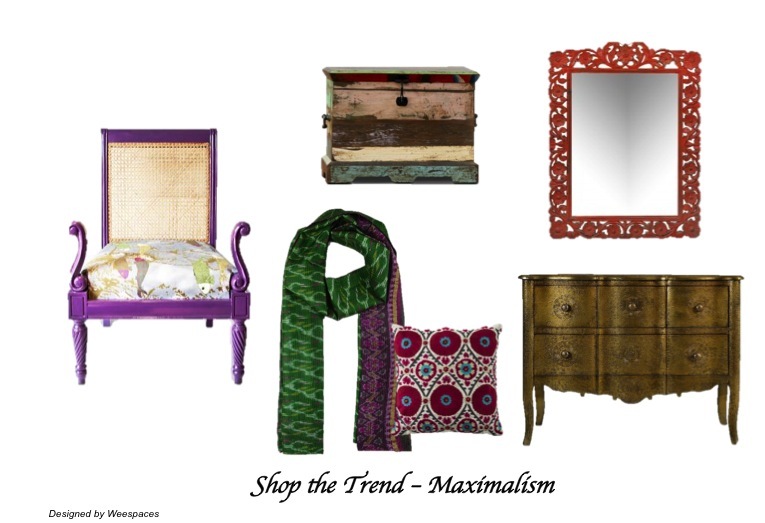 Next up on our series of shop the looks for the top 10 decor trends is maximalism! Its all about bold colors, vibrant patterns, mixed textiles, ornate pieces and layering for a collected look! I recently wrote about the top 10 decor trends on the Home Canvas Blog (click here for the full article) and thought how it might help take things a step further by creating a ‘shop the look’ for each of these trend. So over the next 10 days I will be creating a look for each of these trends using curated handpicked products, that you can simply click and buy! As published on the Home Canvas Blog, here’s my write up on the top 10 decor trends for 2017. Please click here for the full article. We’re seeing green everywhere…forest green velvet couches, hunter green walls and bright emerald kitchen cabinets! Pantone named bright ‘Greenery’ as the color of the year. It signifies reconnecting to nature, outdoors, hopefulness and a fresh start. And juxtaposed with grays, black and white it creates a sophisticated chic look! Bring in some green to your home – leafy plants, pillows, art prints and small objects are easy ways to incorporate the color! 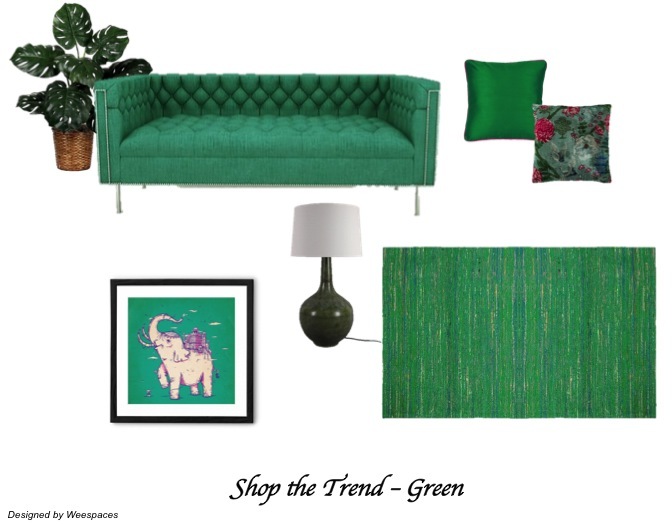 But if you’re ready to go bold we’re loving green couches at the moment….striking and beautiful! The days of clean straight-line minimalism are gone and are getting replaced by bold patterns, ornate edges and layered maximalism. The look is shifting from stark modern minimal to global layered and worldly! We’re seeing a mix of textures and patterns, the use of motifs and murals and rich cultural influences in design. This trend makes way for using your travel treasures, your grandma’s antique trunk or that kantha coverlet on a modern sofa! Pastels and lighter shades are making way for deep rich jewel tones. Purples, ruby, peacock blue, teal and emerald matched with metallics, mirrors and semi precious stones create a look that is luxurious and glam! To get the look think sheer fabrics, accessories, rich velvet pillows mixed with metallics and shiny surfaces to create a subtle yet lux look! In keeping with the resurgence of a more luxurious richer look, upholstered headboards are showing up in a big way! In bold colors, rich textures and patterns they make for a bolder look compared to the sleek light wood and metal headboards that we’ve been seeing. Embrace the look with a headboard in a bright bold color like fuschia or for a subtle but textural look pick a gray linen fabric! Concrete countertops with brass hardware, marble with copper accents and terracotta tiles with gold faucets! The industrial glam look is here to stay! Combining hard and cold materials with glamorous metals and shine makes for a lux but chic updated space. Think marble trays, cement lighting and mixed materials paired with gold, silver and brass accents! Leafy prints, palm trees and tropical patterns are cropping up everywhere from wallpapers to lampshades to pillows! A nod to nature, these patterns help bring the outdoors in and make for a chic breezy look that’s playful yet updated. Throw in some tropical print pillows or for a ‘jungalow’ inspired look do up an accent wall in leafy print wallpaper! Lighting this year is innovative, unique, funky and downright striking! We’re seeing filament bulbs, cement, exposed wiring and geometric shapes of varying kinds. A one of a kind statement piece that can instantly uplift your dining space from blah to aah or a sculptural chandelier occupying center stage in your living room! Make way for some fabulous ceiling lights for a dramatic makeover or bring in some lamps in mixed materials for a quick refresh to your space! Terracotta is the warm that’s offsetting the cold minimal modern look of the past. Terracotta planters, terracotta tiles, flooring and homeware add texture, color and warmth to interiors. Terracotta is a popular trend in kitchens…terracotta floors with kilims and dhurries, earthy matte finish tiles for a rustic warm feel and warm earthy tones that add depth! Raw and natural materials like cork, clay, wood, concrete and terracotta inspired by nature are all making a comeback! Mixed with metals like gold, brass and copper they create an edgy updated look. Cork walls, cork in furniture, matte terracotta tiles, concrete countertops, exposed brick walls and rustic wood are all a nod to this look. With all the deep rich colors, textures and patterns, gray offers a chic muted backdrop to let all the maximalism to shine through! Soft gray walls and upholstered pieces are the perfect canvas for the interplay of pattern, color and texture.